Two suspects in an alleged al-Qaeda-backed plot to derail a Canadian passenger train have challenged the case against them. A lawyer for Raed Jaser, 35, said he would "defend himself vigorously", outside his hearing in Toronto. Officials said the alleged plot had support from al-Qaeda in Iran, although there was no sign of state sponsorship. Canadian authorities said the two suspects were arrested in Montreal and Toronto on Monday. Mr Jaser is understood to be a United Arab Emirates national of Palestinian origin, though his lawyer points out he is a permanent Canadian resident who has lived there 20 years. Mr Esseghaier is thought to be of Tunisian origin. The charges against the pair include conspiring to interfere with transport facilities on behalf of a terrorist organisation and conspiring to commit murder. Neither suspect entered a plea in Tuesday's hearings. But Mr Esseghaier said the charges against him were unfair. "The conclusions were made based on acts and words which are only appearances," he said in French after receiving permission to speak. He declined representation by a court-appointed lawyer. By all accounts, there are still a number of senior al-Qaeda figures in Iran today. Their story goes back to 2001, when American forces and their Afghan allies, the Northern Alliance, were heading towards Kabul to overthrow the Taliban government. Iran's Supreme Leader Ayatollah Ali Khamenei was worried about having American troops on his country's doorstep - so he opened communication with the Taliban and agreed to provide them a safe way out of the country. In Iran, restrictions were imposed on them by the Revolutionary Guards and Iran's myriad intelligence agencies. But some may still have been active in establishing contacts with the al-Qaeda network, even helping to raise funds abroad and provide assistance and guidance to members, without the knowledge of the Iranian authorities. What is clear is that the presence of senior al-Qaeda figures has now turned into a huge liability for the government of Iran. Family members of Mr Jaser attended his hearing, where the court banned the publication of evidence and testimony in the case. His father, Mohammed Jaser, told reporters outside court: "I don't know nothing. Let the police do their job." 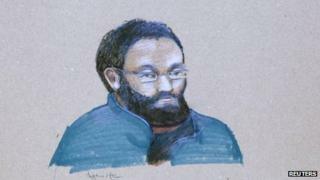 The accused face charges of conspiracy to carry out an attack and kill people in association with a terrorist group. Mr Jaser's lawyer Mr Norris questioned the timing of the arrests, which came as the Canadian parliament debates an anti-terrorism bill that would reintroduce "preventative detention" and investigative hearings. "I don't know what their purposes were but their timing was notable to say the least," Mr Norris was quoted by the Globe and Mail newspaper as saying. Mr Esseghaier was studying for a doctorate at National Institute for Scientific Research near Montreal, while Mr Jaser reportedly worked as a customer service agent at a removal firm. Canadian media have reported the investigation was launched after a tip-off by a concerned imam in the Toronto Muslim community. The imam was worried that young people in the city were being corrupted by an extremist. Authorities say the two accused had planned to derail a passenger train in the Greater Toronto area. The alleged attack was "definitely in the planning stage but not imminent", Royal Canadian Mounted Police (RCMP) Chief Superintendent Jennifer Strachan said on Monday. The Globe and Mail newspaper reported a Toronto-New York City train was to be the target. But VIA Rail, which operates passenger rail services across Canada and carries nearly four million passengers annually, said the public was never in danger. The RCMP said the investigation was a collaborative effort with FBI agents from the US. Iran has denied any links with the two suspects. Iranian Foreign Minister Ali Akbar Salehi said it was "ridiculous" to suggest any connection between al-Qaeda and Tehran. Al-Qaeda - a militant Salafist Islamic movement - preaches a radical anti-Shia ideology that is seen as placing it firmly at odds with Shia Iran. A US justice department official said there was no connection between the alleged Canada plot and last week's Boston Marathon bombings.